It was not always like that. Those tracking the progress of democracy in India should interview political activists above 90 years of age. 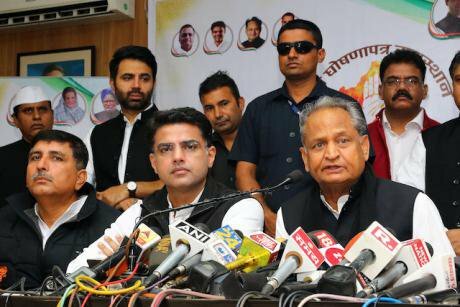 Leaders address media during the release of the party manifesto in Jaipur for Rajasthan Assembly Elections 2018 Campaign. NurPhoto/ press Associatin. All rights reserved. Large hoardings in Jaipur, the capital of one of the five poll-bound states in India, call upon the voters to celebrate the democracy “festival” – tyohar, the Hindi word for a religious festival. The Election Commission’s messages are not needed because the poll-related celebrations are in full swing. Campaigners hired on daily wages go around waving party flags and shouting slogans. The festive spirit is reflected in the viral videos of drunken men unable to hold the party flags properly, shouting incoherent slogans. The democracy festival (also called utsav) coincided last week with six festivals associated with Hinduism, Sikhism and Islam. These were dedicated to Guru Nanak, Prophet Muhammad and Hindu Gods waking up from sleep. Devout Hindus celebrated the second Diwali (Festival of Lights) of the year – this one named Diwali of Gods. There was a wedding anniversary of a sacred plant to the God turned into a stone. And there was a holy day dedicated to gooseberry! The tourists got the impression that in India any time is festival time. Hoardings put up by the election commission urging the voters to participate in the Democracy Festival and vote! All rights reserved.Many festivals memorialise the eternal war between Gods and Demons, good and evil. This evocative theme is adapted by rival candidates to project their electoral battles. The religious festivals strengthen the belief that mythology is history. In the newer New India, this belief is tapped by the Hindu nationalists for their political campaigns. So, for example, the devout masses led by political leaders have decided where and when Lord Ram was born. Modernist political leaders had managed to restrict the jurisdiction of faith till the Hindu nationalists burst on the scene demolishing a mosque in 1992 and demanding the construction of a Ram temple on the ground that it was precisely on that plot of land that Lord Ram was born. It was a brilliant idea to polarise the Hindu voters. The demand for building the Ram Temple there leads to mass mobilisation before every election and this is precisely what is happening now in the run-up to the provincial elections in five states. Since Prime Minister Narendra Modi’s Hindu nationalist party came to power in 2014, faith has intruded in the political arena with great force. Secular politicians are branded “sickular”. The BJP President Amit Shah declares that law courts should pass judgments that are “implementable”. He said this after a law court asked a temple to allow the entry of young women. The Hindu nationalist party organised a protest against the leftist state government that is bound to implement the judgment that has “hurt Hindu feelings”. Politics is now all about feelings.Politics is now all about feelings! Similarly, “elections are coming!” is an announcement that makes the peace-loving people a bit anxious. Some almost dread the “democracy festival”. A poet says if there are tensions on the border, it is election time in India! A musician has popularised on YouTube his songs denigrating democracy. Stray violence on the polling days apart, at times public property is destroyed by the fans of an aspiring candidate who is denied the party’s ticket. This happened in Bikaner, a city in Rajasthan. The report of this violence also included a reference to the past when the city’s political culture was harmonious. The candidates opposing each other used to have dinner together from the same plate. And two politicians – one Hindu and one Muslim – were happy to be popularly known by each other’s surname affixed by their constituents! Reports appearing during an election campaign dishearten democrats. The Hindi newspapers of Rajasthan print the lists of dagi (tainted) and bagi (rebels) candidates after the tickets are distributed by the parties. Commentators total up the costs of conducting elections and the annual expenditure on the elected legislators. It comes to a staggering amount. And these paid representatives are charged with “doing nothing” since the parliamentary proceedings are disrupted frequently. Some commentators conclude that democracy be damned! The impact of democracy on urban planning is one topic that gets little attention. The erstwhile rulers built well-planned cities that stand out in sharp contrast to the unregulated ugly colonies that have sprung up in the past few decades. The siting of slums and the encroachment on public lands is linked with the creation of vote banks. The powerful lobby of real estate developers in league with politicians have managed to destroy some beautiful cities. Many candidates are tainted by criminal cases against them. The candidates may face charges of rapes, domestic violence, corruption, inciting sectarian violence and even murder. The newspapers routinely publish the names of the candidates facing criminal complaints. In some elections, more than 30 per cent of the candidates are thus tainted. But their record is ignored by the political parties if they are considered capable of winning. In many cases, the voters, impressed by the candidate’s money and muscle power, ignore his reputation. A large number of candidates lack proper academic qualifications. The data on their academic background perhaps makes people question about the use literacy. The commentators criticise the system that prescribes no academic qualification for law-makers but lays down the minimum qualification for a Government employee who merely carries files from one room to another! Having high academic qualifications is no advantage in politics. The past few years have seen the political class losing respect. Vicious personal attacks on each other during the poll campaign bring political leaders down in public esteem. There are no role models left which makes competent and honest persons stay away from politics. So, the democracy festival, like some religious festivals, calls for celebration as well as a wake. The din and false propaganda associated with prohibitively expensive election campaigns disheartens democrats. Elections diminish democracy. It is indicated by anecdotal evidence and academic studies. Only recently in openDemocracy, Gunvald Nilsen wrote about the “slow-motion suffocation of the world’s largest democracy set in train by the ruling BJP in 2014”. Political coercion and cultural nationalism are joined at the hip in BJP’s authoritarian populism, he says. “As with policing of activism and dissent, the making of a cultural and religious Other is a profoundly violent affair.” There have been comments on the emergence of the Republic of Fear in which democracy has no future. Those forecasting the slow death of democracy in some countries write about the erosion of civil liberties in democratic countries, the dominant role of money power in influencing election results, a rising tide of populism, the spreading cancer of divisive politics, the growing appeal of nationalism, misuse of religion in political campaigns and the entry of fools and fanatics in the political arena. Coming back to the current poll season in India, one observes the democratic spirit vanishing from the outwardly impressive exercise of the voting power by the masses. Weird reports come from the five states that are going to elect the provincial governments. The chief minister of a poll-bound southern state boasting of a technology hub seeks Divine help for his victory. Seventy-five Hindu priests conduct a special worship to improve his electoral prospects. The Hindu agitators mobilised by the extended political family of the ruling BJP are asking the Modi Government not to wait for the Supreme Court judgment in the land dispute case and instead pass a law for building the temple. They threaten to build the temple themselves! The agitation is expected to take an interesting turn just before the national elections next year. The ruling party mobilised Hindu priests and heads of religious institutions who at a mass meeting voiced their full-throated support to the Prime Minister. Some astrologers have let social media broadcast their forecast that Modi will be the Prime Minister again after the 2019 elections. The agitation is expected to take an interesting turn just before the national elections next year. Opportunism is adopted by all parties and candidates as the key principle in politics. The external pulls and pressures make the selection of candidates for fighting elections even more difficult. The complexity of the exercise can be gauged by raging controversies, scuffles between the rival factions and mid-night conciliatory meetings in the homes of the mediators. Opportunism enlivens the poll season generating newspaper headlines about a host of party functionaries switching their political loyalties and crossing over to the opposite camp. These are no isolated cases. Heavy cross-traffic marks the days during which political parties announce their candidates. Some are denied tickets by their party and others leave the party because they calculate that their party is unlikely to win this time. The candidates who are denied the party ticket promptly announce that they will fight as Independents. Some of them are immediately fielded by the opposition party because of their ability to win! There can be no better evidence of the end of ideology. The candidates who won the last elections on the secular platform are busy this time inflaming passions in the name of Hindu religion. Some who won the last elections by playing the Hindutva card now display their new-found belief in secularism! It was not always like that. The newly independent India won admiration when it gave the voting right to every adult. Those tracking the progress of democracy in India should interview political activists above 90 years of age. One such retired leader told a Jaipur daily that during his days, the lists of candidates used to be finalised in the modest state party office and no more than two or three cases would be referred to the party high command in New Delhi! Now the state units of all political parties have been disempowered! The candidate selection drama takes place in New Delhi, giving sleepless nights to the party leaders and to the aspiring candidates. There was a time when groups within a party would hold meetings and pick the name of a candidate through consensus. Their leaders will then approach the person and persuade him to fight the election! Several such instances are recalled by these veterans. An old-timer in Jaipur says in an interview that he did not have one hundred rupees to buy the party’s form for applying for the ticket and thus there was no question of his fighting the election. His party workers asked him to seek nomination and paid for the form. The party chose him, and he won the election. This was the political scene in 1977! The veteran recalls the days when every party used to field candidates with a record of work. The applicant’s dedication and commitment used to matter, not his wealth. Then, one had to be persuaded to fight the election, these days aspiring candidates fight and kill to secure the party ticket! The applicant’s dedication and commitment used to matter, not his wealth. The budgets for fighting elections used to be tiny and the party manifestoes that became irrelevant over the years were read with care. Any candidate defecting from one party to another before or after the election was considered a dishonourable character. Now a defector does not loose face and even wins due to his influence or wealth and the voters’ caste-based loyalty. For him his party’s ideology was never of any use. The veterans lament the decline of the spirit of democracy. They suggest that the pillars of democracy have eroded and find the current democratic scene dismal. The standards of parliamentary debates have fallen abysmally low just as public discourse on politics has got vitiated. Rising intolerance has made reasoned debates impossible. Civil political leaders have become rare. A veteran recalls past incidents such as one in a state legislative assembly when the Speaker responded to a critical reference about him by leaving his chair gracefully and saying that he has lost the confidence of the House. The member went to him, apologised for his remark and requested him to go back to his chair and proceedings were resumed. A vehicle mounted poster of Rajasthan chief minister and BJP leader Vasundhara Raje seeking votes.